Outsource2india is a leading Mechanical, Electrical & Plumbing (MEP) Design and Drafting service provider, working as an extended arm to engineering teams across the world to help customers produce superior quality MEP Designs and Drafts. 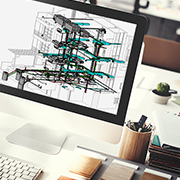 We help mechanical and electrical design engineers, consultants, & contractors, with their design and drafting needs to help them stay ahead of competition. We help convert designs as well as marked-up images into digitized CAD drawings to allow standardization and consistency to aide profit and growth. With over two decades of experience providing support to global Mechanical, Electrical & Plumbing companies for their design and drafting requirements, Outsource2india caters to a wide range of sectors including education, healthcare, residential, commercial, retail projects, etc. Partnering with us for your MEP design and drafting requirements ensures a superior quality job at an economic price. Outsource2india's Mechanical Design services cover the whole spectrum right from concept design to detail design and analysis. Engaging in the industry's best practices, our very strong domain knowledge and expertise in leading software, in various industry verticals offers a host of services as part of our design and drafting services. Read more about our HVAC services. Outsource2india's Electrical Design and Drafting Services offer exceptional and superior electrical designs. With the simple use of geometrical information, we deliver high-quality services by syncing electric logic diagrams with electric wires using the latest software and create electrical schematic layouts and PCB designs for all electrical and electronic equipment. Layouts for lighting showing lighting fixtures, emergency lighting, etc. Read more about our Electrical Design and Layout Services. Outsource2india has highly skilled plumbing drafters and detailers who are pioneers in plumbing designing and drafting services. We provide highly effective and accurate Plumbing Engineering Solutions in adherence to worldwide industry standards. Our engineers develop accurate Plumbing designs and drafts for residential, commercial and industrial buildings to global clients. Outsource2india provides MEP conversion services for hand-drawn sketches, mechanical drawings, and MEP concept drawings. We convert them into accurate and precise 2D and 3D CAD designs. The input formats include PDFs, AutoCAD files, GIF or JPEG files, pictures, photos, scanned images, hand-drawn sketches and electronic files, and convert them into the format requested by our client. Outsource2india offers customized MEP engineering services to clients within a short period of time. We fulfill all the requirements and specifications of our clients and deliver accuracy and efficiency in our designs. We adopt an approach that is a cost-effective as well as time-bound. Here are reasons aplenty for you to choose Outsource2india for MEP design and drafting solutions. At Outsource2india, we have the infrastructure, expertise, and over a decade of domain experience in offering customized MEP solutions for diverse business needs. So, if you have decided in outsourcing MEP design and drafting services to India, look no further. Get in touch with us today. Our team will be glad to assist you.